Yuksam - Sachin - Bakhim - Psoka - Phedang - Dzongri - Pelling.. Anything not included in part of the program not included..
Fruit Juice, Airated Water, Bottled Water etc not include. Non-Standard food item not include..
Un-utilised resources cost would not be refunded. Any unplanned activity/stays and food at un-planned locations/ diversions due to act of Gods.. cost of the same is excluded..
Share jeep transport cost (NJP to Pelling on actuals). About few of the places covered or places around this region. About 35 km from Pemayangtse lays the first capital of Sikkim where the first Chogyal of the kingdom of Sikkim was consecrated in 1641 AD by three learned Lamas. The Norbugang Chorten nearby still has the evidence of the consecration ceremony in the form of stone seats and a footprint of the head lama on a stone. The name `Yuksom` means the meeting place of three Lamas. Situated at an altitude of 1780 mt, the place is famous as the starting place for mountaineering expeditions and treks to higher Kanchenjunga ranges. The famous Dubdi monastery is an hour's trek from Yuksom. For trekkers going towards the Kanchenjunga base camp or the Dzongri - Goechala region, this is the place where it all starts. About 9 km from Yuksom is the 'phamrong' waterfall. A bridge nearby provides excellent glimpse of the waterfall. Yuksom can be approached either from Tashiding or from Pelling. The road from Tashiding passes through dense forests. Visit to Kechopali Lake, Monasteries near Pelling, Crown of first Chogyal King of Sikkim, Phuntsog Namgyal. (Places to be covered depends upto time available and energy level of the participants). Tshoka is one of the ideal places to watch the sunrise over Mt. Pandim. Settlement is sparse but cultivation of various crops in summer is a common practice. This is your next night halt after Bakhim. 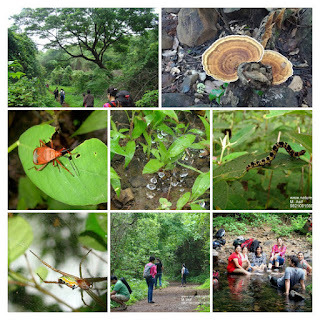 The trek trail gently follows uphill along the Rathong River gorge, through dense mixed jungle with magnolia, rhododendron, ferns and several varieties of orchids, brightly colored birds, and the occasional monkey. One hour trek should bring to a point where you cross the Paha Khola bridge, (1,733m./5,685ft.). There is a swimming spot by a waterfall for those who can dare the chill of cold water. Around couple of hour into trek you you can stop for a snack break by a bridge over stream. Passing by sweet smelling viburnum we cross the Prek Chu River and then ascend steeply for two or three hours to arrive at Bakhim. A little higher up is the picturesque Tibetan refugee settlement of Tshoka where we set up camp. This is a long trekking day and you should expect to be pretty tired by the time you arrive at the camp. 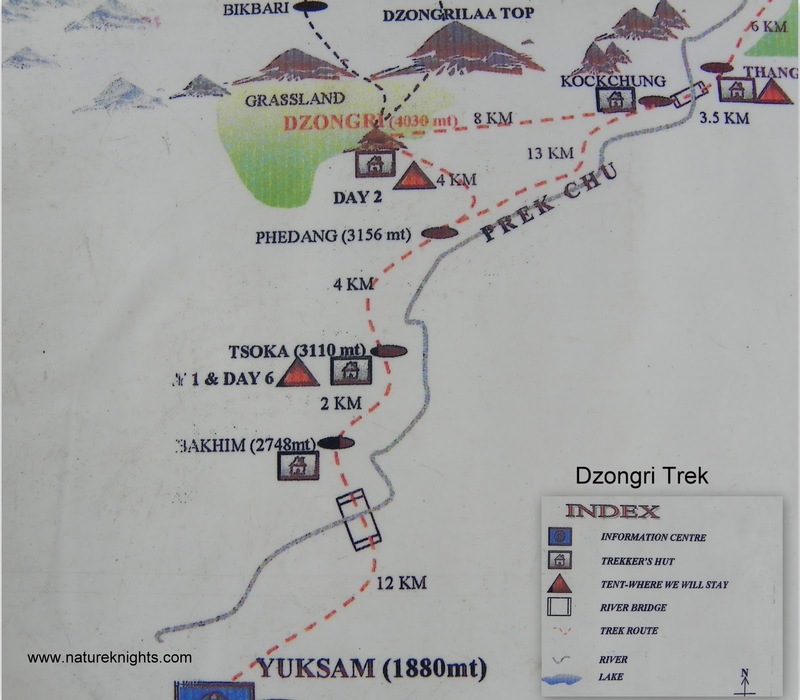 Dzongri is among the best trekking destinations not only in Sikkim but also in India. The Snow white peaks all around Dzongri are bound to keep you gazing with awe.The view from this place is like a paradise with patchwork of greens and gold streaked with blue - reminiscent of an abstract etching, framed by the majestic snowcapped peaks shining not very far away. The awesome presence of the great mountains thrusting their snowy peaks deciphers the strength of the Tethys Sea bulging its muscles to reach this towering height. No less than 14 of them soar majestically to 20,000 ft. plus. The centre of attraction of course remain the Kanchenjunga. Snowfall is common around Dzongri especially during the winter months. The trekker should be well prepared to face the cold. The temperature may go below freezing point any time around the year. The trek to Dzongri is among the tougher ones in Sikkim. Even the experienced porters and guides get tired after reaching Dzongri. naturebeyond strongly recommend trekkers should go for regular fitness exercise for at least a month before coming for this trek. Thangsing situated at the base of the Jopine peak at 3930m. Beautiful natural scenery can be seen all around. Samiti Lake in Zemathang is beautifully enclosed on three sides by the Kanchanjunga, Pandim and Jopine peaks. When the sun comes up, the lake really sparkles with its clear water. The myriad colors of the lake indicate either rocks on the bed or the depth of the bed itself. When it's cold, the surface of the lake freezes over. It had already freezed slightly at the edges forming a thin layer of transparent ice when I had reached there. You can also see the path of the inlet stream beneath the lake surface at the top left corner of the lake. In Sikkim, the Goecha La trek takes the trekker up-close for a spectacular view of the mighty Kanchenjunga amidst a majestic panorama of the other lesser Himalayan giants within its range of mountains.